Carpel tunnel syndrome is a rather common problem in individuals that can cause pain and weakness in the hand, which in turn is developed from pressure on the nerve in the wrist. However, the popular thought that carpel tunnel syndrome is developed from sitting at a computer all day is not accurate. This does cause pain and stress on the hands, but it is not the same condition. Instead, this problem develops from additional strain and weight placed on the hands, such as lifting boxes all day or even from playing the guitar for long periods of time and pressing down on the guitar. Regardless of the reason carpel tunnel syndrome develops though, it is important to go through the carpel tunnel release surgery in order to correct the problem. The procedure is an outpatient surgery, so the individual is able to return home the same day after the procedure is performed. It is a rather basic procedure where a small cut is made in the palm of the hand near the wrist. 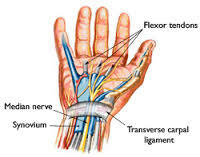 Here the transverse carpal ligament is cut in order to reduce the pressure placed on the median nerve. Depending on the severity of the issue, some of the nerve around the region might be removed as well. From there, the hand is stitched up. Some reduced feeling can occur in the hand and it is important to not extensively use the hand for strenuous work for several days before the hand is able to completely heal. However, once the surgery is performed the person should feel much better and not have to deal with all of the pain in the wrist. The surgery can be performed on both hands at the same time, although it can make certain tasks a bit difficult for a few days after surgery.